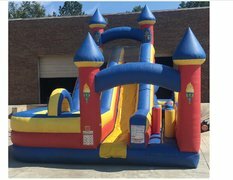 Our 18ft Climb & Slide is sure to make them smile! 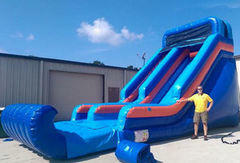 THIS DRY SLIDE NOT AVAILABLE July - August----ONLY USED Wet During This Time. 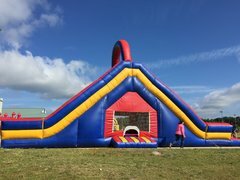 Our 18ft Super Blue Climb and Slide has an extented slide for even more sliding fun! This is a TRUE 22ft Slide. Super steep for maximum speed! PICKUP NOT AVAILABLE for this inflatable. Due to the high level of setup difficulty, this inflatable in only available for Delivery. 24' Giant Slide. PICKUP NOT AVAILABLE for this inflatable. Due to the high level of setup difficulty, this inflatable in only available for Delivery. 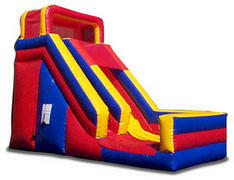 This 24' Slide is a blast for toddler, teens and adults. 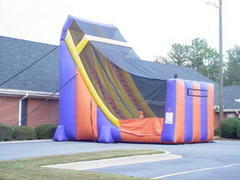 it features a rope climb up and slide down as wll as a bounce house.